Harrisburg, PA, United States (4E) – Actor Johnny Depp has reportedly changed his knuckle tattoo from the world “slim” to “scum” amid the ugly divorce he has with his estranged wife of 15 months Amber Heard. According to reports, the original knuckle tattoo was nickname for Heard. However, the divorce and the domestic abuse scandal might have urged the 53-year-old actor to change the former term of endearment to a demeaning word. This comes after Heard filed for divorce against the actor late in May. The latest photos of Depp showed that the letters l and i were changed to c and u. He was touring in Pennsylvania with his band Hollywood Vampires and was spotted with the supposed altered tattoo on Friday. 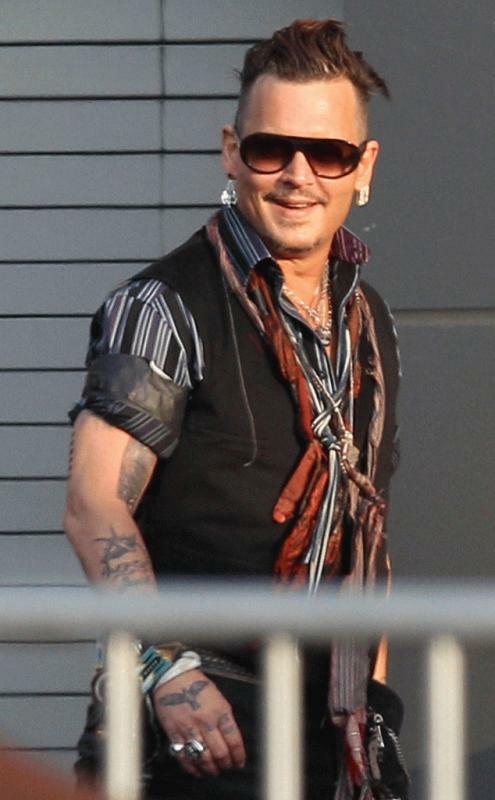 Depp or his representatives are yet to comment on the tattoo adjustment. More on the nickname of Heard, he also had a tattoo that has the words “Come with me… Slim” inked on his right elbow. It was unclear if this was altered as well. The tattoo was first spotted during a press conference for the 2013 film “Lone Ranger.” During that time, Depp and Heard have been dating for a year. Depp and Heard are in the middle of a legal dispute. Heard has been granted a temporary restraining order against the actor five days after filing for the divorce after claiming that he has been physically, emotionally, and mentally abusive against her during the tenure of their relationship. The matter will be heard in court this August to know whether or not the restraining order will be removed or extended. It also is not clear what their divorce settlements will be. Depp and Heard met on the set of “The Rum Diary” back in 2009. However, they only started dating three years after their first meeting shortly after his split with his former partner Vanessa Paradis , who is the mother of his two children.